Thanks to the great efforts of Peepo and Tom Roger Skauren, many disks have been preserved that used to belong to the late Gary Sabin – who wrote the US Gold loading music and handled mastering duties. The disks were passed to a friend of the family, Rich Hinton – who has kindly allowed them to be preserved. 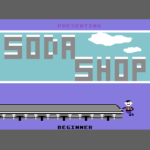 One of the games found was this one called Soda Shop, which is a simple clone of Tapper that was written for a company called Micro Fantasy in California, possibly around 1984 time and submitted to US Gold in the UK for evaluation. 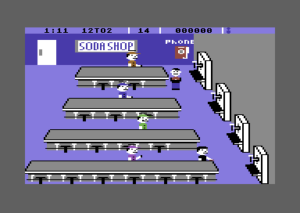 Clearly the company felt the game was not up to scratch, but a copy was made and passed over to Rich from Gary. 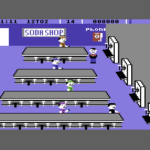 US Gold probably had Tapper licensed by that point anyway. It’s a nice curiosity that seems to be a complete game, and great to see preserved. Hopefully the developer will see this page some day and get in touch to talk about the game.